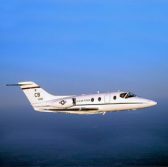 A subsidiary of L-3 Communications has received a one-year, $49.2 million contract modification to provide logistics support services for the U.S. Air Force‘s T-1A Jayhawk trainer aircraft. The modification exercises an option on a previously awarded contract to L3’s Vertex Aerospace business for contractor-operated maintained base supply, on-equipment maintenance and data services, the Defense Department said Friday. Vertex Aerospace will perform work through Sept. 30, 2017 at various Air Force bases in California, Mississippi, and Texas as well as at Pensacola Naval Air Station in Florida. Raytheon designed the T-1A to support specialized undergraduate pilot training for airlift or tanker aircraft as well as navigator training programs of U.S. and international defense customers.